How do I test my limits? Run 10 miles solo. I've been taking advantage of summer break and doing my long runs on Friday mornings so that my weekend time is a little more open. Most of the local group runs are on Saturdays/Sundays and mrC has had more Friday trips lately, so it's just me. How do I test my limits? Choose a hilly route for my long run. Last time I ran my long run on a local trail. I was planning to do it again, but it was a little creepy running secluded by myself. Option #2 was to run from home which meant a hilly route with one big hill right in the middle. I went for it since, ZOOMA Cape Cod has hills! Sunday - 4 mile run just before daylight so I had to dig out the reflective gear. Monday - 7 mile run in Newport where there are in fact, HILLS! Later we went kayaking in Newport Harbor and it was a killer arm workout. Tuesday - 4 mile run around the base mostly along a running trail. Then a bike ride along Ocean Drive and Bellevue Ave with gorgeous water views and mansions galore! Thursday - 4 mile run with mrC. It was cool and cloudy which made this run feel nice and easy. Friday - Ran my 10 mile long run alone again. Even though I hated the idea of going solo, I did it. I kept my pace comfortable and felt good the whole time. I had to walk part of the killer hill in town, but felt really good overall. Lots of foam rolling, stretching, and compression gear the rest of the day. 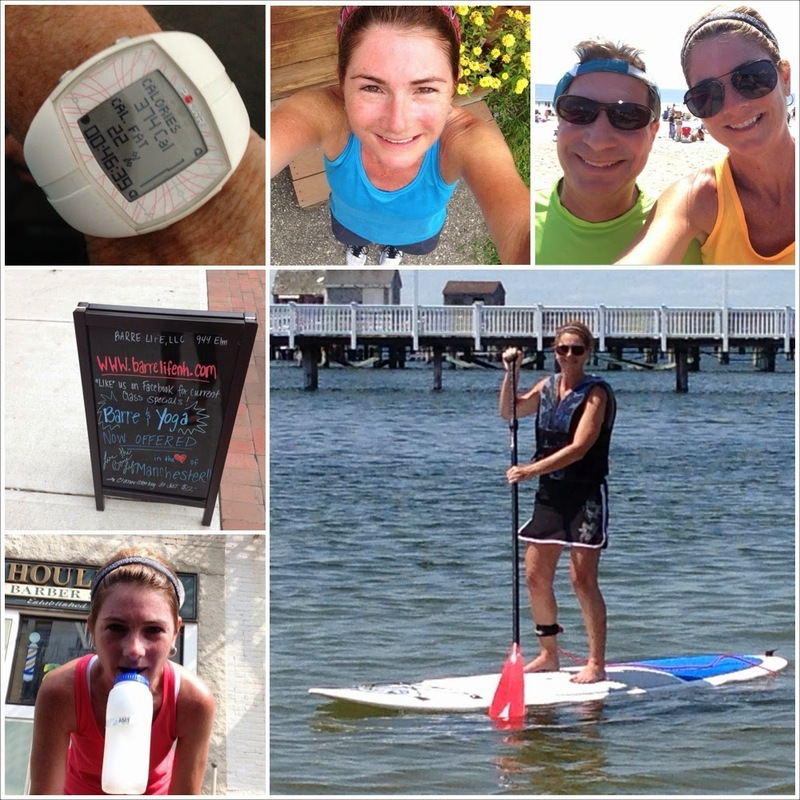 Saturday - Cross training at SurfSet! 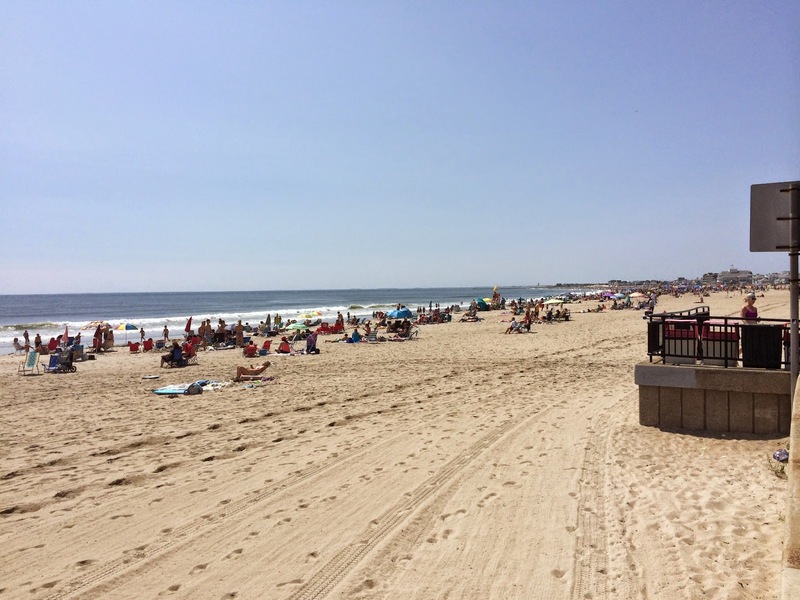 We usually spend multiple weekends in Newport, but this busy summer had us going during the week. 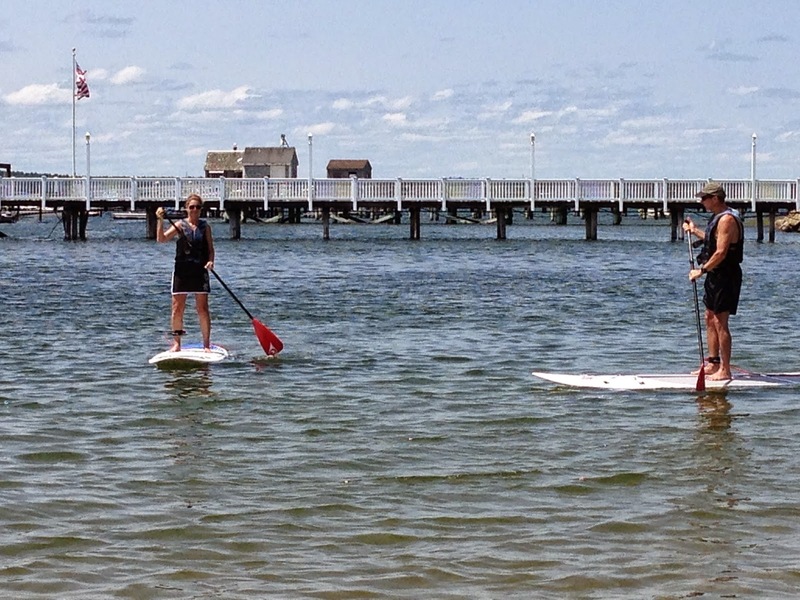 When visiting the city by the sea, one thing I love to do is pack fitness into our days. So in addition to the traditional activities we've become accustomed to, we also tried some new ones. Before heading out of town, I packed my bags with everything I would need for our fitness fun. My Athleta swimsuit did double duty at the beach (w/ JCrew cover-up) and kayaking (w/ Athleta shorts & Corey Vines racerback). 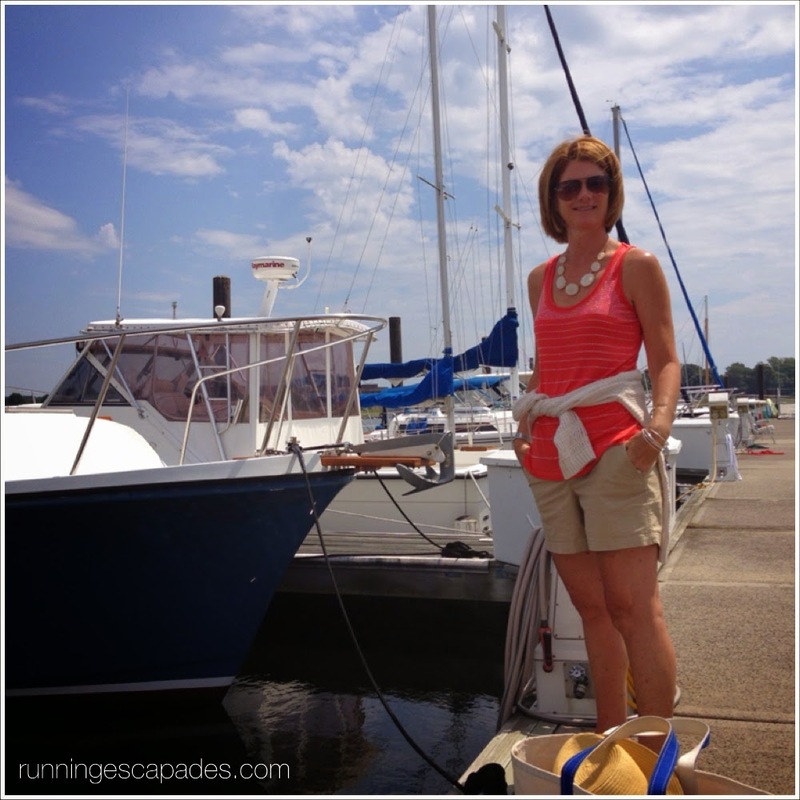 My favorite Old Navy shorts and tank with my BR sweater kept me comfortable on the boat. Oiselle, Athleta, Nike and Mizuno completed my run outfits. First we met some of my in-laws for an afternoon of sailing and motor boating. This requires absolutely no work from me (other than carrying the boat bag), but my sunrise run completed first thing in the morning allowed me to remain guilt-free while mrC worked the boat. Every October, Newport hosts a marathon, half marathon, and 5K. This year mrC and I will be running the half marathon, so when planning where to run our 7 miler it only seemed natural to run along the marathon course that ends at Second Beach. It's a hilly route, but the gorgeous ocean views and dream homes help take our minds off the inclines. It's also delightful to relax on the beach afterwards. 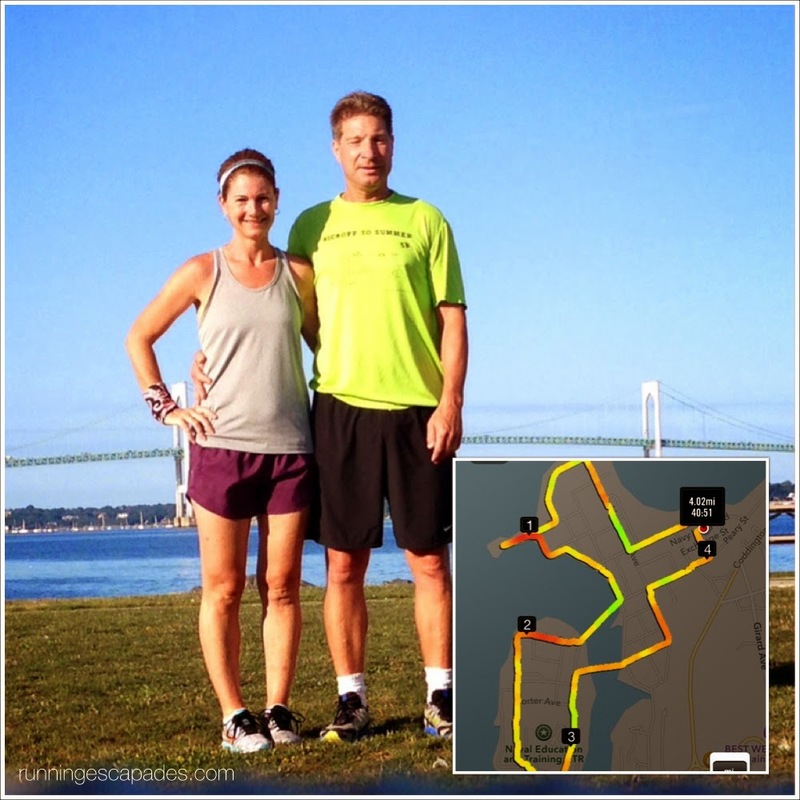 The map below is from RunGo, an app that gives you turn by turn directions using GPS. Since I don't wear earbuds (just a wrist wallet from Sprigs) I missed the call out for a horse shoe turn after the turn-around and the app didn't really respond well. Trust me, I cannot run across water! I see people kayaking in Newport all the time and this summer I decided to try it. Although I was feeling brave, I wasn't brave enough to take out my own kayak. Two things worried me: boats making wake and tipping me over and jellyfish. 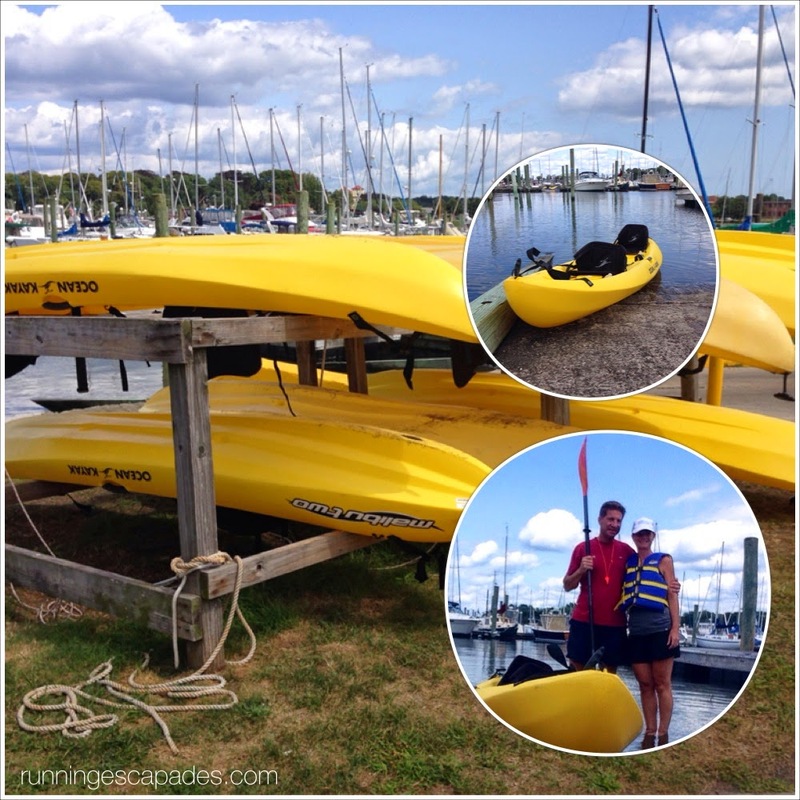 So mrC and I rented a two person kayak. Once we were in the kayak and moving, I mostly forgot about my fears and focused on keeping my arms moving. Five minutes in and I was tired! It was an intense upper body workout, but super fun. One of our favorite places to run is right on the base. 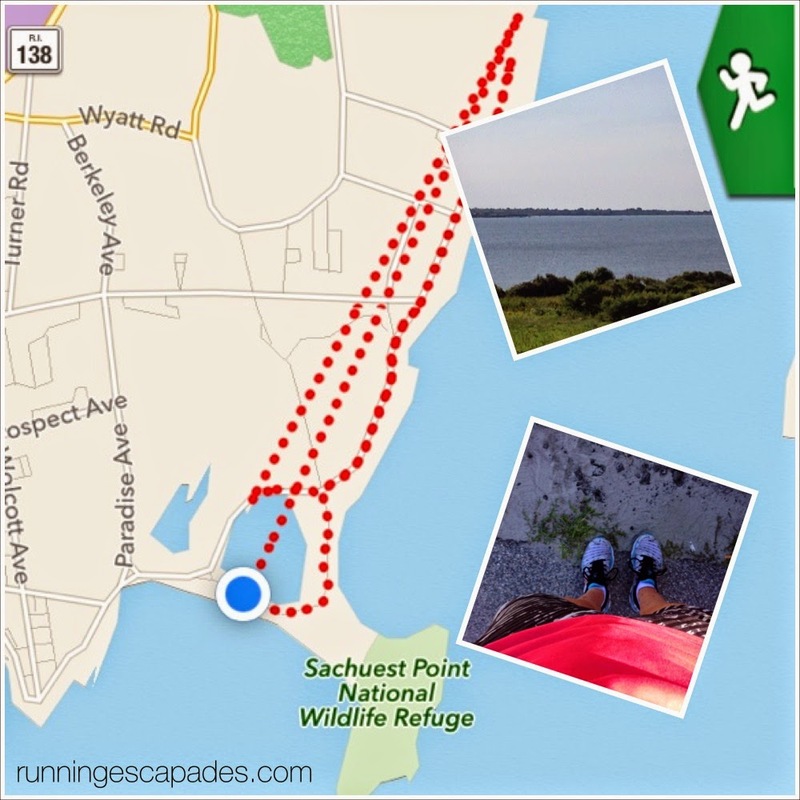 There is an unpaved, mostly flat path that loops the base offering awesome views of the Narragansett Bay and Pell Bridge. I tried to map out a 4 mile loop using the RunGo app, but the app closed when I hit save (and of course it didn't save the route). You can't visit Newport without taking the 10 mile drive. 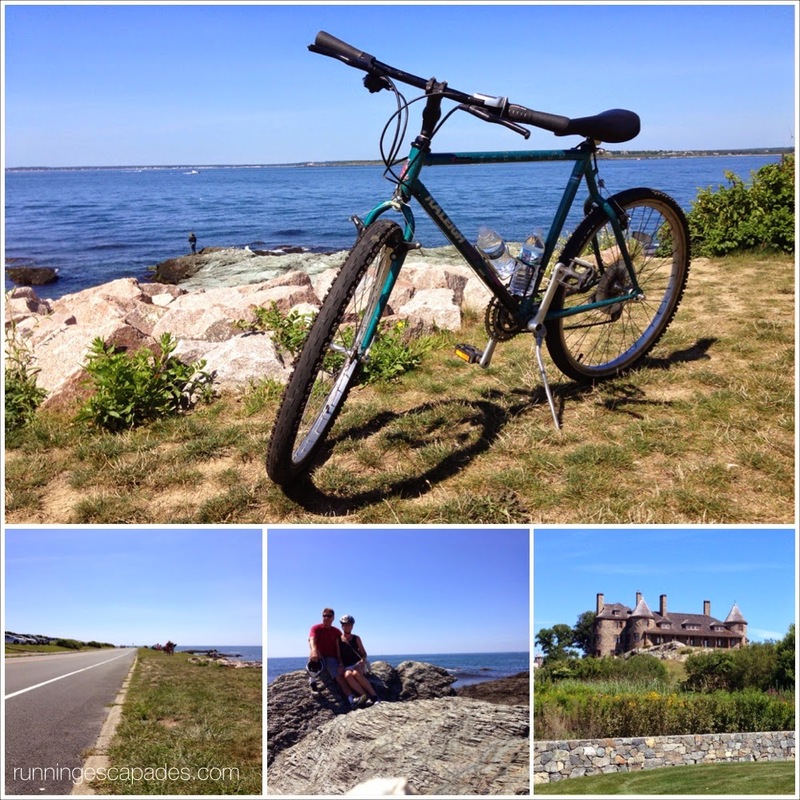 Instead of driving, we took a bike ride along Ocean Drive and Bellevue Avenue. The roads are bike friendly and there are oodles of places to stop and explore. I don't know why we didn't do it sooner! 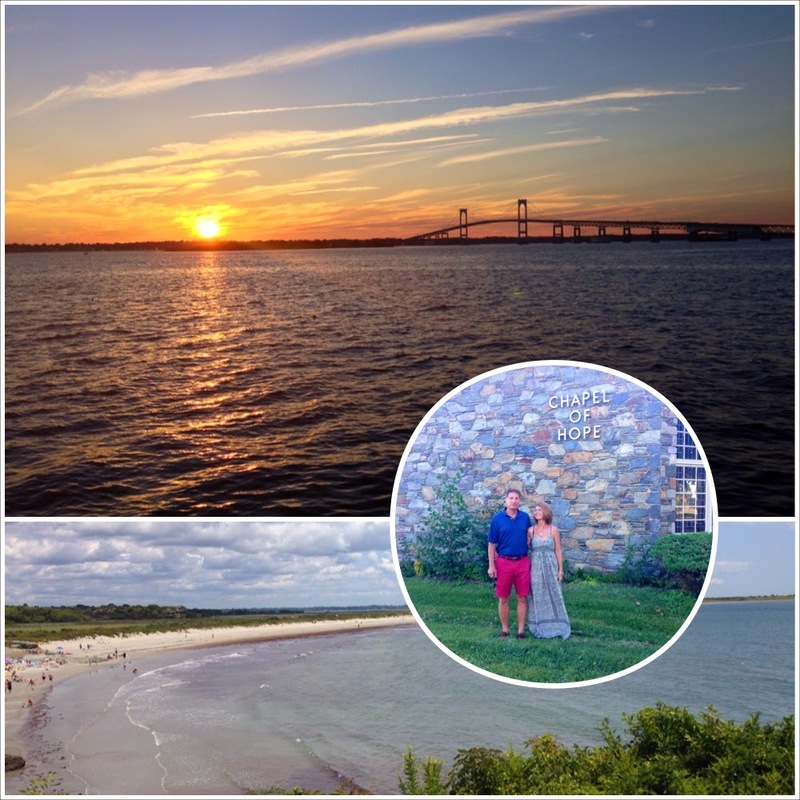 We always love taking road trips to Newport, but this visit was just about perfect. Between the beautiful weather, the gorgeous views, and the fun fitness activities, we didn't want to leave! Do you have a favorite road-trip destination? That is exactly how it felt when I ran on the AlterG Anti-Gravity Treadmill at Sport & Spine Physical Therapy, Inc. in Portsmouth, New Hampshire last week. 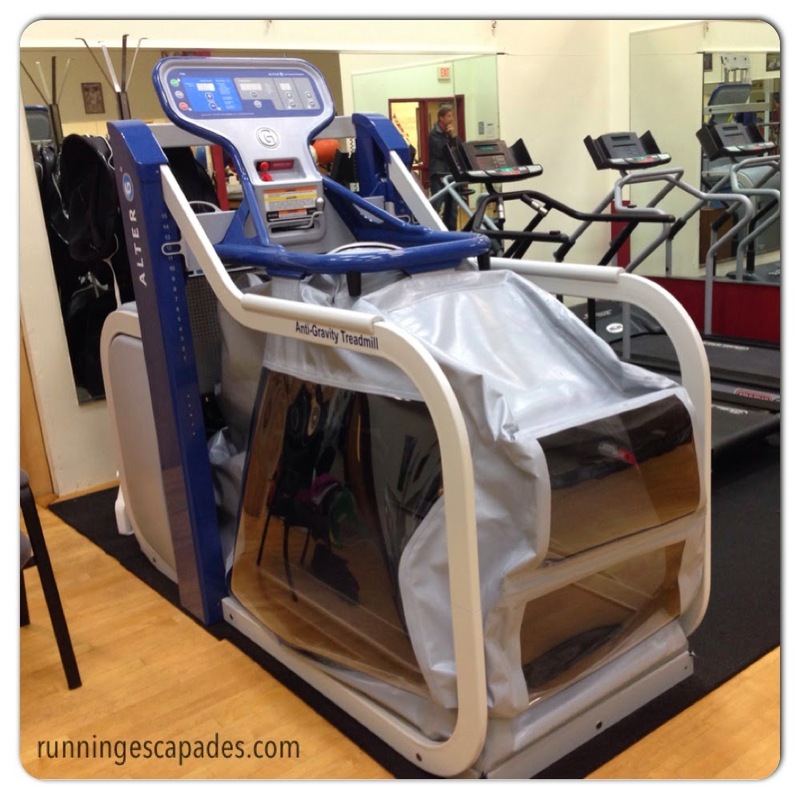 I climbed into the neoprene shorts, stepped on what felt like any other treadmill, and zipped myself into the pressurized air chamber made with technology straight from NASA. 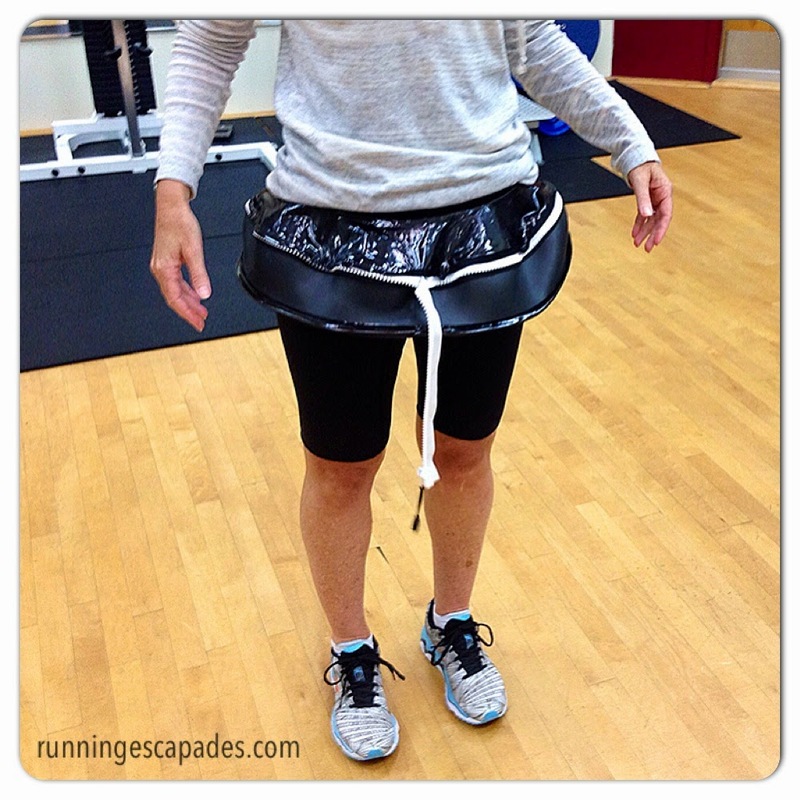 These shorts were provided, but clients who frequently use the AlterG often purchase their own. In front of me the control panel had the familiar buttons of my own treadmill at home; display options, speed, incline, but on one side additional plus and minus buttons allowed me to adjust my body weight in 1% increments. 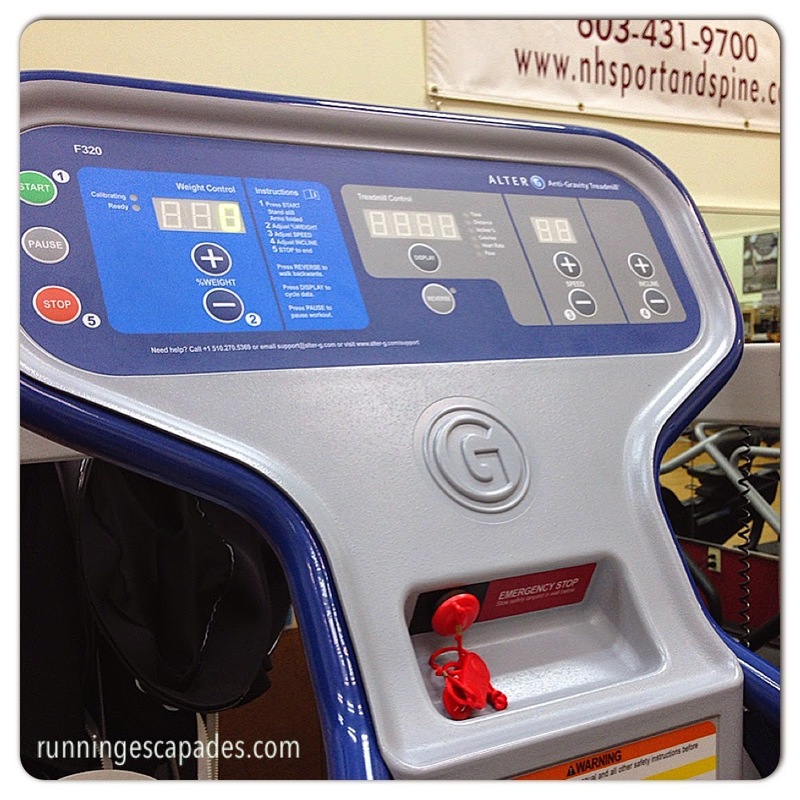 Dr. Chris Campbell, physical therapist and owner of Sport & Spine Physical Therapy, pressed the start button and the chamber began to fill with air while the machine lifted me up to my tiptoes as it calibrated my body weight. In a matter of seconds of pushing the button to reduce my body weight to just 20%, I was ready to run as effortlessly as when I was a young soccer player dashing around the field. But that's not all this machine can do. In the stationary position you can easily do painless squats and jumps. It also has a reverse mode. 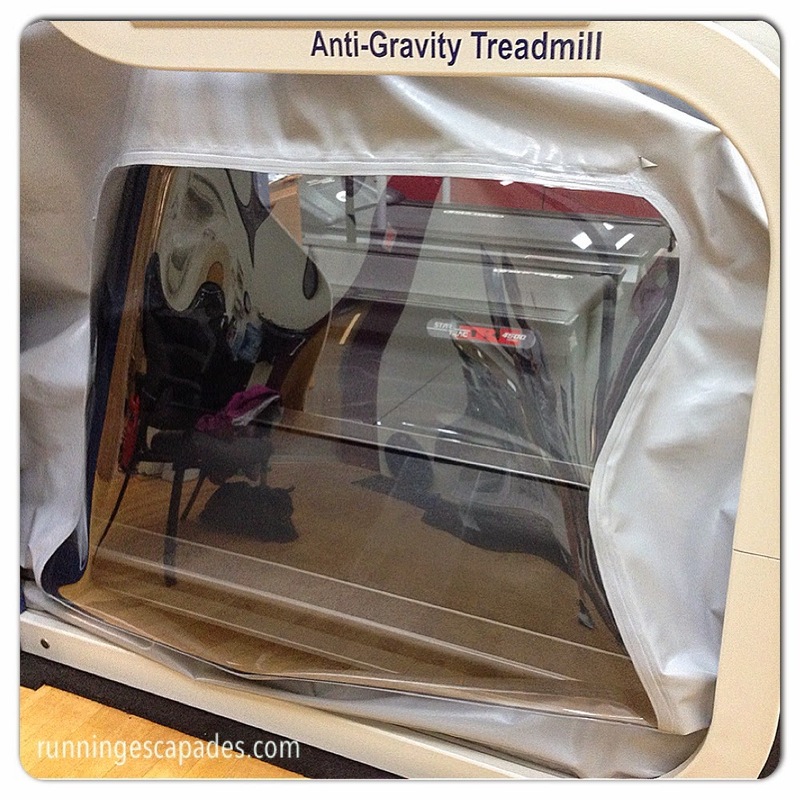 Originally designed for NASA by engineer Robert Whalen to maintain astronaut fitness, the AlterG Anti-Gravity Treadmill became a commercialized prototype in 2005 after Robert's son Sean, an engineering student at the time, reached out to Alberto Salazar, coach to the elite Nike runners, for feedback. After fine-tuning the machine, the first AlterG was sold to a pro basketball team and Nike made a purchase of six. Manufactured in the USA, AlterG is now classified as a medical device and used in more than 1000 facilities for low impact patient rehabilitation, weight loss, and athletes training through injuries. Recreational and competitive athletes can also use the AlterG to supplement training without risk of stress related injuries. In fact at Sport & Spine Physical Therapy, it can be rented in 30 minute workout sessions for $15 or less if you purchase a punch card. If there was an AlterG in the Manchester area, I would consider using it to replace those days when I would have sat out because of pain in my calf or hamstring. 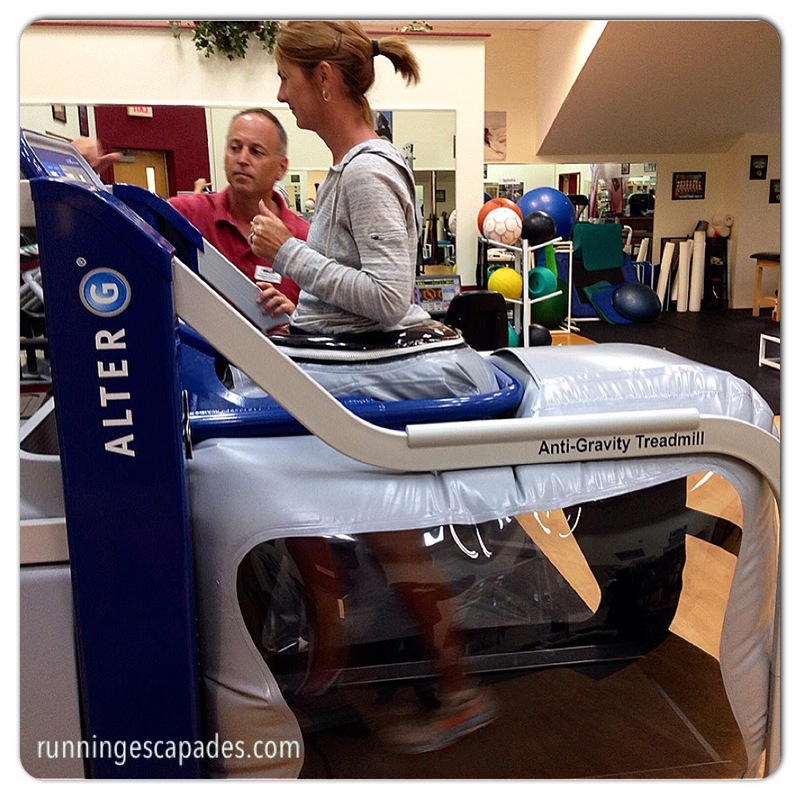 Would you use the AlterG as part of your training? Special thanks to Outside PR for setting up my demo at Sport & Spine Physical Therapy, Inc. and to Dr. Chris Campbell for his time and expertise. When I read the description from the coach program on my Nike app for week 5 of my half marathon training, I chuckled. Speed? Me? Right! Then I thought, what the heck? It's worth paying at least a little attention to the suggested workouts. During my long run at the end of the week, I realized that I am feeling stronger. Although I wouldn't say I'm speedy, I am happy with the way I feel on my the longer runs. 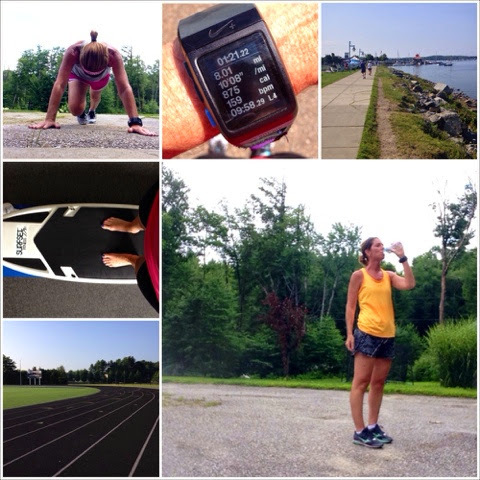 Sunday - 4 mile run along the Burlington waterfront with mrC. First 3 miles at an easy pace and faster last mile - I did mile 4 at 8:55 (yay). Monday - 7 mile run with MRTT group (of two!). It was supposed to be a 5 mile fartlek run, but I forgot! I did do the last 3 miles faster than the first 4 and that's where the hills were! Tuesday - Since I messed up the fartlek on Monday, I figured 3 miles at Track Party Tuesday would make up a little of it. The party turned out to be just me, but I did my "speed work" anyway. 1 mile WU, 4x200s, and 1 mile CD. Thursday - 4 miles from home. I did the first three miles at a comfortable pace and the last one fastest. Friday - I was nervous about doing my long run alone and on a trail, but this run turned out much better than I thought it would. I kept my pace mostly in the 930-945 range, and saved my speediest mile for last at 920! Saturday - Rest - Did a little cross training at SurfSet with mrC. Because of busy schedules and being out of town, I hadn't been to class in over a week, and it felt really hard! I still love the total body workout though. I'm feeling good about starting week 6, especially since I'll be doing it in Newport! What are you training for? How is it going? Summer is the best time to take a road trip and explore new places. Even though I have lived in New England for six years, there is still plenty for me to see. 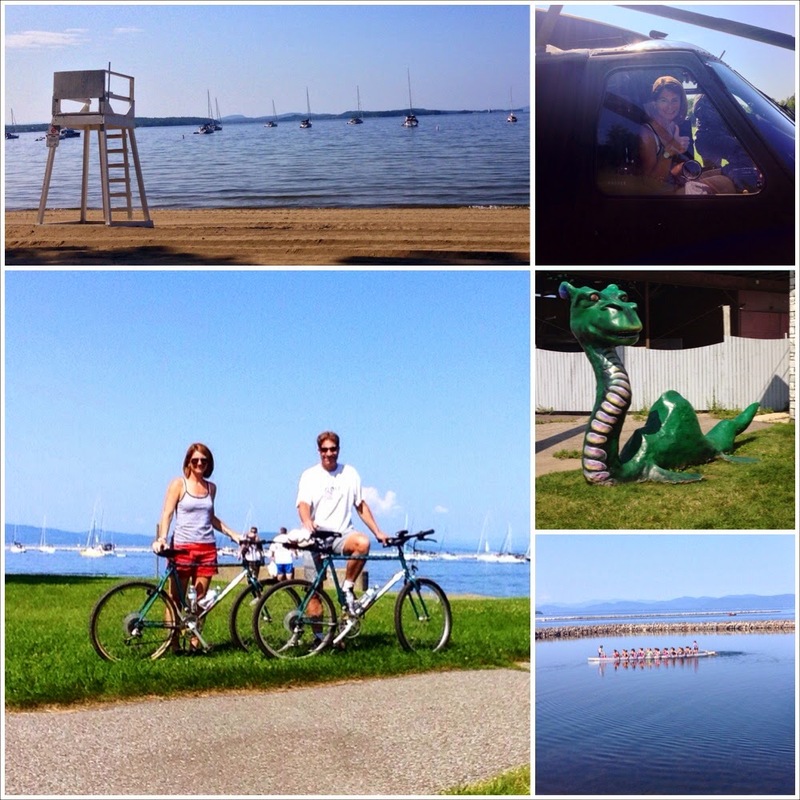 Recently mrC took me on a weekend getaway to Burlington, Vermont complete with running and biking. 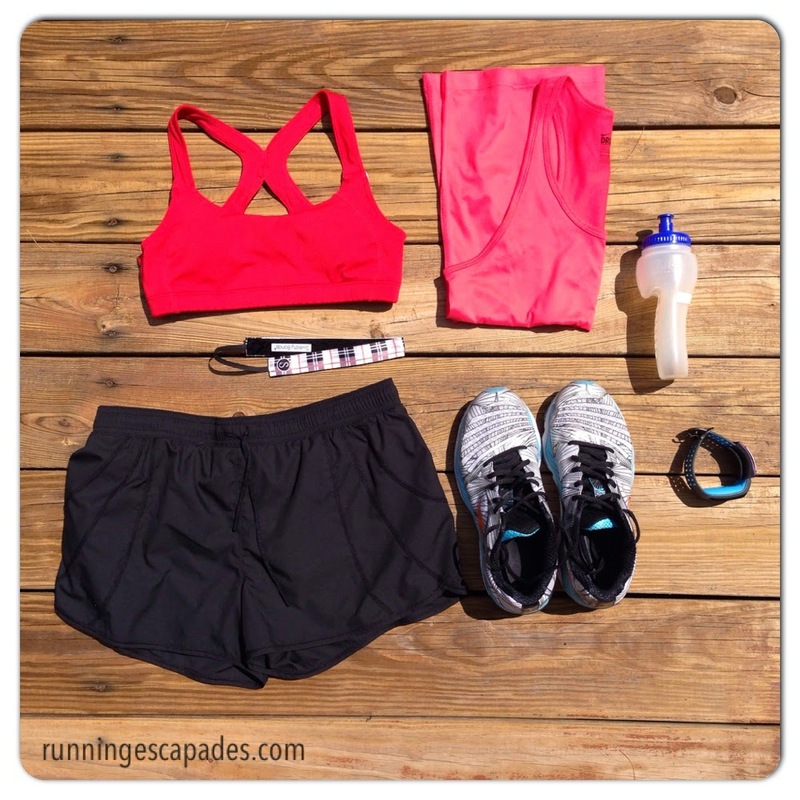 The weather was predicted to be perfect for packing up a few of my summer running favorites, along with my running gear essentials. Burlington has a really nice bike trail system that runs north and south of the city that is also perfect for running. I chose Airport Park as our starting point because it offers free parking, rest rooms, and easy access to the trailhead that heads north along the historic causeway. We got a later start than we had hoped, so the 8 mile run was warm. It took about 1.5 miles to actually reach the causeway which was disappointing, but not for long. The views of Lake Champlain were amazing. We followed the Island Line Trail until we reached the Bike Ferry and turned around. Wanting to be ready for anything, I threw together a mix of items for the bike ride along the waterfront. This time we hopped on the bike trail at North Beach Park and rode south into downtown Burlington. Once again we had gorgeous weather and spectacular views for an amazing 10 mile ride. Along the way we watched an Army rescue training session and even sat in a Blackhawk helicopter. I learned the story behind Champy, the Vermont equivalent of the Loch Ness Monster and watched a little of the US Women's Dragon Boat time trials. Where did your last road trip take you? It's hard to start a training week on sore legs, but that's what I had to do for week 4 of my ZOOMA half marathon training. Luckily, I can find some extra motivation on the ZOOMA Cape Cod Training Page to help me push past the hard parts. Despite my sore legs, this week of building endurance was a success. In fact, I felt really good after my long run and went on a nice bike ride the next day. 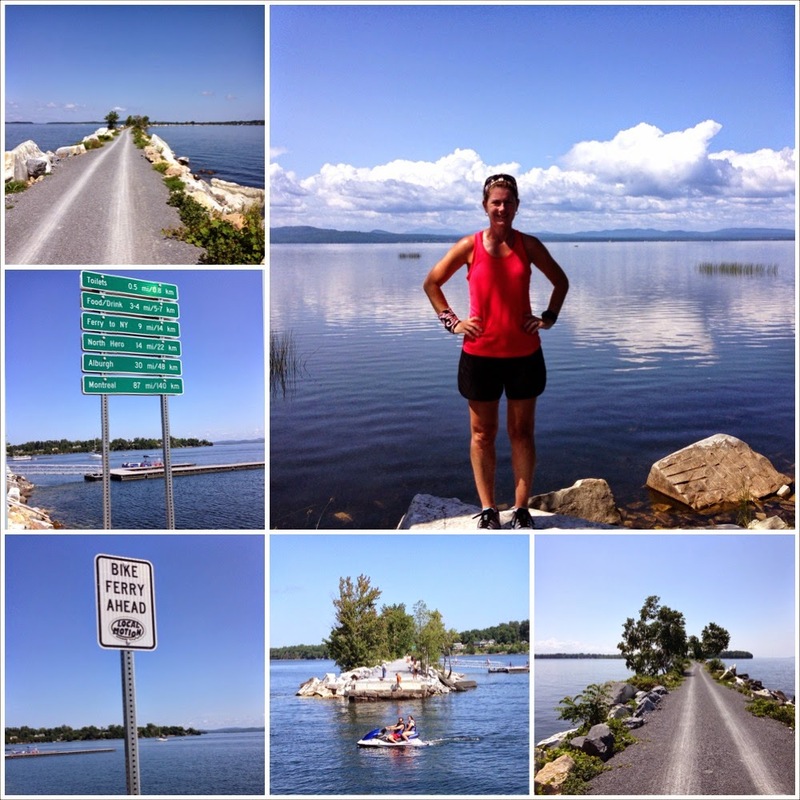 Saturday - Enjoyed a leisurely, sight-seeing 10 mile bike ride on the Island Line Bike Trail in Burlington. How do you deal with sore muscles? 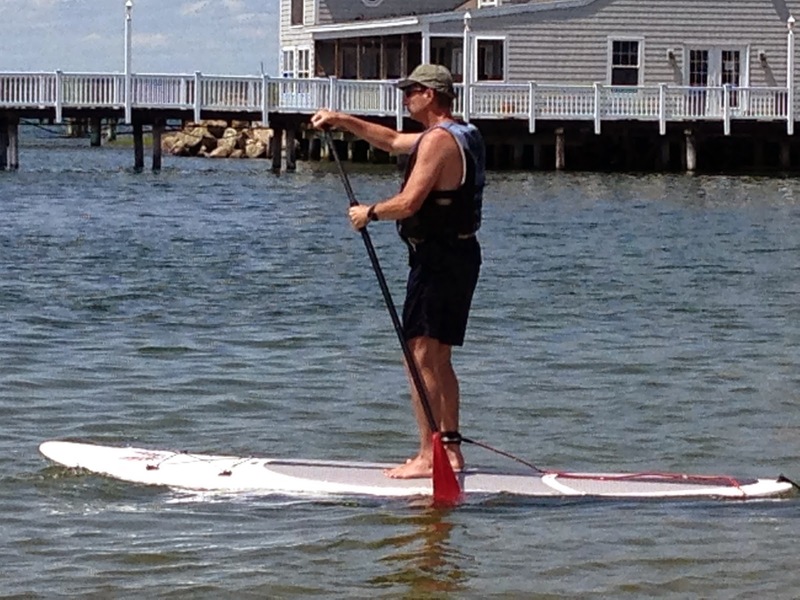 At the beginning of the summer I put Stand Up Paddle-boarding on my summer-to-do list (here) and last week mrC and I headed to Hampton Beach to make it happen. Since our appointment wasn't until 1PM, we decided to start our day at the beach with a 3 mile run. I could run everyday looking at views like this. 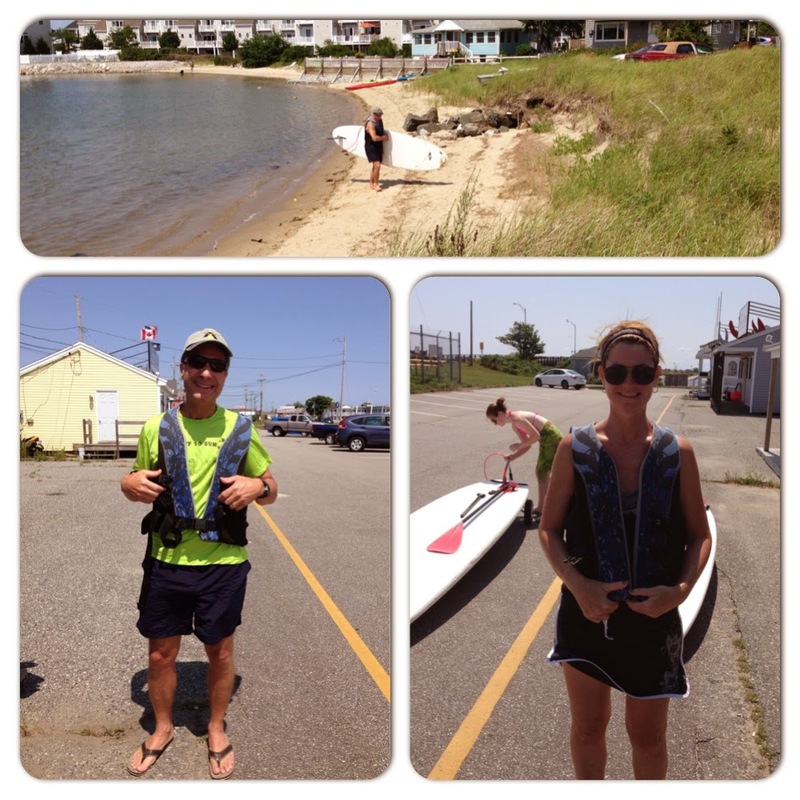 After having lunch and relaxing at the beach, we walked over to Hampton Parasail and Stand Up Paddle. 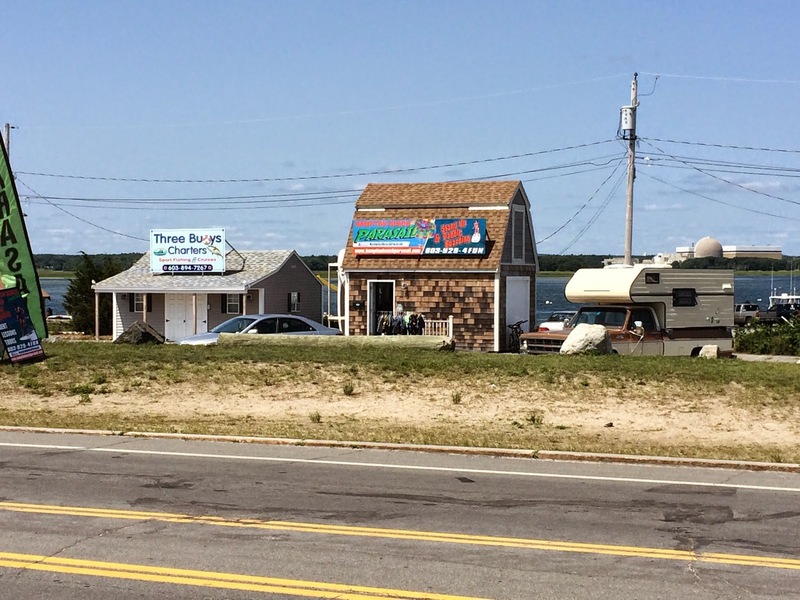 The business operates out of a small building on the harbor across from the beach. After checking in, we picked out life vests, prepped the boards, and then carted them to the cove where we would spend our one hour lesson. The one hour lesson began right away. We put the boards in the shallow water and climbed on getting into a kneeling position first. 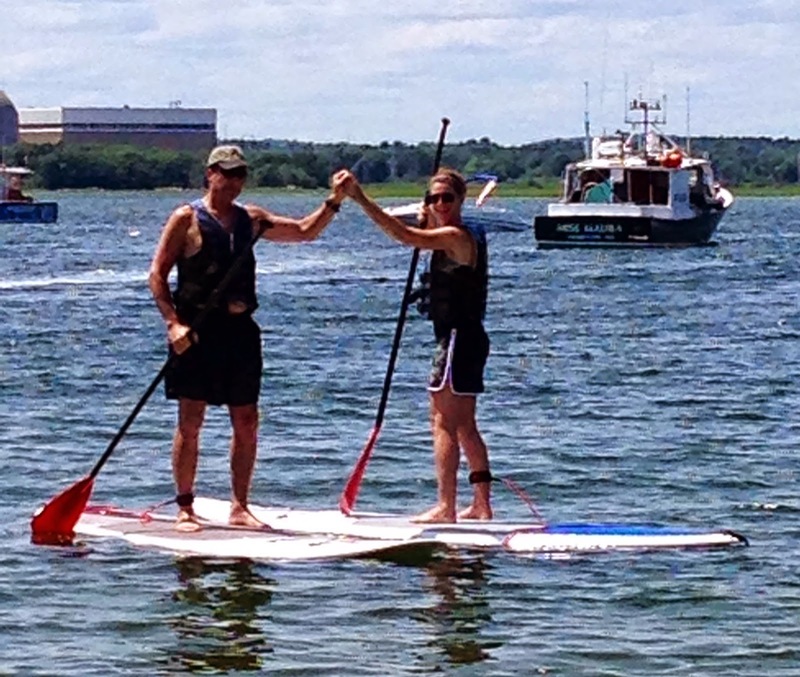 After a couple of minutes using the paddles, our instructor guided us into the standing position. 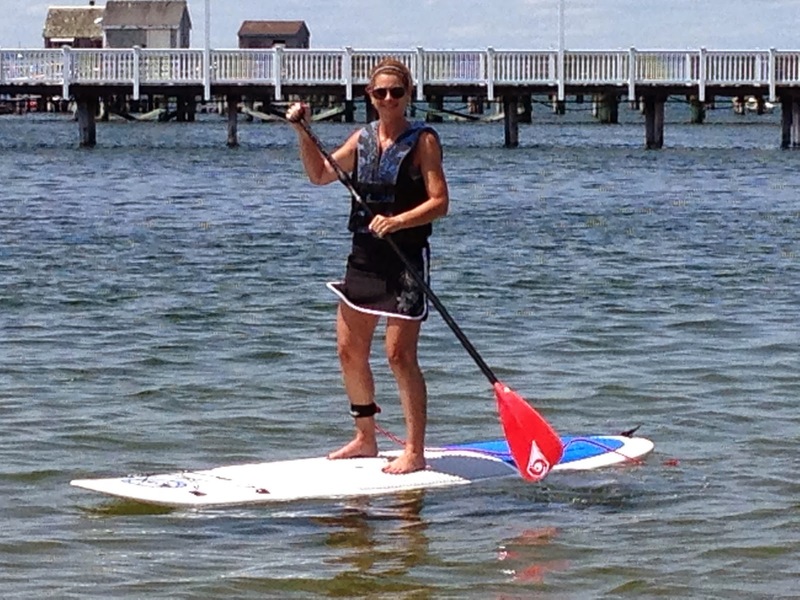 She showed us how to manage the waves and use the paddles to make a turn. She also had us practice kneeling down and standing back up in the deeper water. We followed her around the cove and on a little adventure under a couple of piers. Then we were on our own. I'm confident that all our urban surfing at SurfSet classes (see my review here) helped us with our balance on the boards. 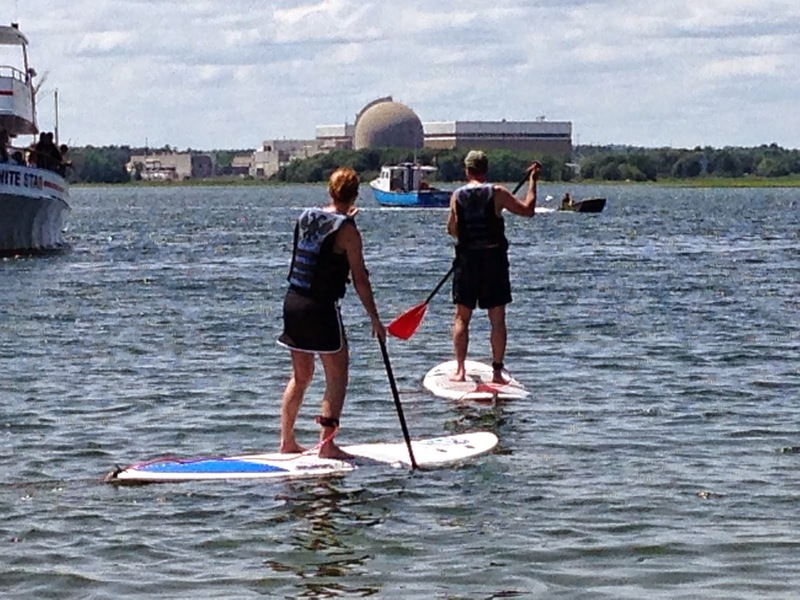 What do you think about Stand Up Paddle-boarding? When I came across the article Basic Stretches For Tight Hips on Pop Sugar, I knew my hips would be changed forever (see the article here). My favorite pose in the 8 pose sequence is the Open Lizard. Then I found another article (here), 10 Yoga Poses for Runners on Fitness Magazine's Pinterest board. A couple of the poses were for targeting tight hips. I like this one. Last week after a kettle bell-swinging-squat-happy SurfnTurf class, two barre classes, and my long run, my legs were toast. Using theses stretches, I was able to rid my legs of most of the DOMS while working on opening up my tight hips. Since I know that most runners are in the same boat as me, I had to share these articles. Not only will they help our tight hips, but they are also great stretches for our legs in general. What is your favorite hip opener stretch/pose? 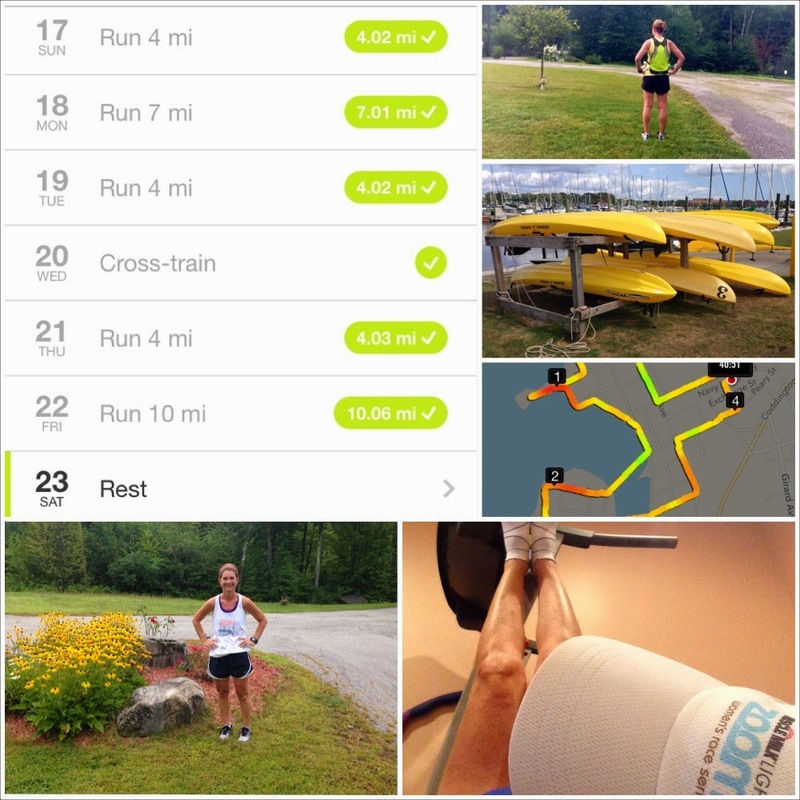 ZOOMA week 3 was about building strength with more miles, increasing the distance on my long run, and adding more running days to the schedule. In addition to what was on my training plan, I also added a couple more cross-training workouts. I felt really good on all of my runs, but by Friday my legs were toast from barre classes. I met the planned mileage for the week and the goal for the Summer Run Challenge that I've been doing, but from now on, I will limit cross-training workouts to non-running days or after shorter runs. Sunday - Zip lining in West Virginia which gave my arms and core a really good workout (recap here). A friend commented to me on how lucky I am to have all this time to run and go to fitness classes, and I couldn't agree more. 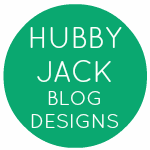 I have been trying to take full advantage of my summer vacation and cross all the goals off my summer-to-do list (read post here). During the school year my focus turns to running because it's challenging to squeeze in exercise around teacher duties, sporting events, and family time. 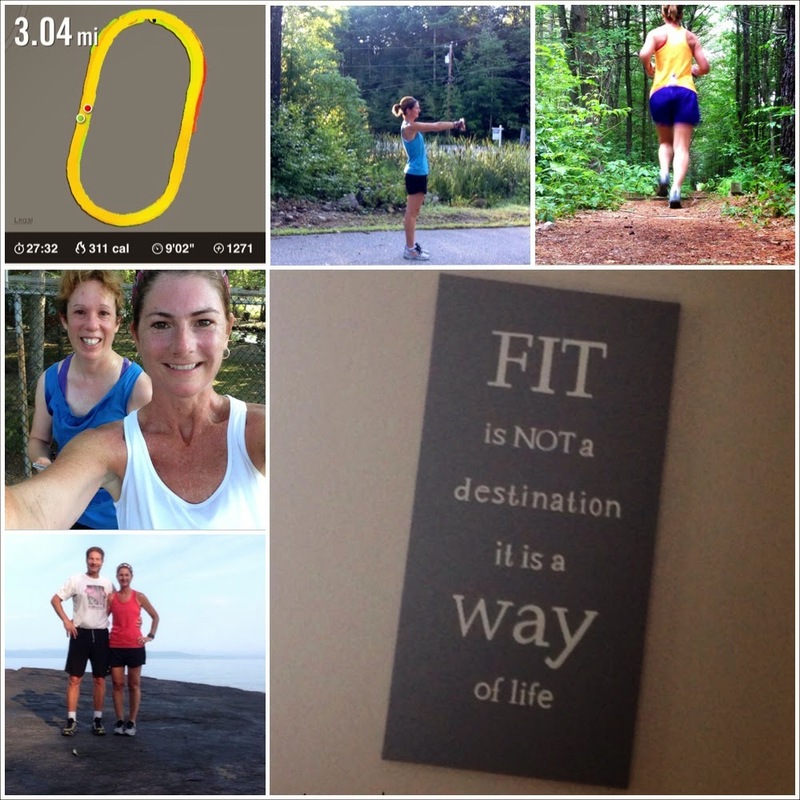 Does your fitness focus change throughout the year? Do you ever have dreams about running? I do. I used to have dreams about playing soccer when I was younger. Even after I got hurt playing in college, the dreams continued. Since I couldn't play soccer anymore, I started running. When I started dreaming about running, I knew that I had a new passion. I recently read the young adult book The Running Dream by Wendelin Van Draanen and couldn't put it down. This book is about a high school runner who loses her leg after an auto accident and her graceful, brave triumph over adversity to return to running with the help of her family and friends. When I began reading this book, I couldn't stop thinking about the victims of the Boston Marathon bombing. People who have essentially faced the same challenges as the fictional character of Jessica. We hear their stories and updates in the news, but there is so much that they have to face that we will never truly understand. This book, although fictional, gave me an insight that has made me appreciate the strength, resilience, and courage it takes to literally get back on two feet and step up to a new starting line.